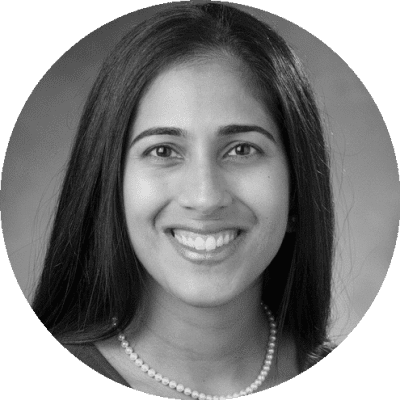 Dr Manisha Palta is a radiation oncologist and the Director of Clinical Research in the Department of Radiation Oncology at Duke University and is a member of the Duke Cancer Institute. She primarily treats patients with gastrointestinal cancers and is actively involved in clinical research trials. Dr Palta has always liked helping people, and in college volunteered in the oncology ward. She knew then that she had found her passion. Interacting with patients is her favourite part of the job. She likes to explain how radiation works and how it can benefit them. Her hope is to provide her patients with an explanation that gives them less anxiety and less fear about the treatment. Dr Palta’s primary clinical focus is the treatment of gastrointestinal malignancies. She is the principal investigator of three prospective, investigator-initiated studies. The first seeks to optimize the neoadjuvant regimen for patients with potentially resectable pancreas cancer by incorporating neoadjuvant systemic therapy and stereotactic body radiotherapy (SBRT). The second is an investigator-initiated study evaluating the addition of immunotherapy, pembrolizumab, into the neoadjuvant treatment of resectable esophagogastric cancers treated with chemoradiation. This project involves 2 tumor biopsy and 5 liquid biopsy collections during the trial for tumor immunophenotyping. Lastly, she is conducting a multi-institutional, prospective, randomized phase II study evaluating quality of life differences with liver SBRT or percutaneous ablation in patients with non-operative hepatocellular carcinoma.